iFunbox is a very cool installer for cracked apps. Using iFunbox you can download and transfer any file to your iOS device. iFunbox is among the best alternatives to Installous but unlike installous it is not a mobile app but a desktop version. Install iFunbox on your PC (Windows or Mac), download the IPA files of cracked apps on your PC and then transfer them to your iOS device in no time. AppCake and vShare are also very good alternatives to Installous. You can try them too. Do check my earlier posts - How to install vShare Cydia version and how to add Appcake from Cydia to iOS. Below is a simple tutorial on how to install iFunbox. I have also shared some features and how to use iFunbox guide. Before installing iFunbox do remember that iFunbox enables you to download free cracked apps on your iOS device. And for running cracked your iOS device needs to be jailbroken. So do jailbreak your iPhone or iPad before using iFunbox. Also install Cydia on it. It will help you to download more free apps and keep them updated. Once you have jailbroken your iOS device you now need to install iFunbox on your PC. It doesn't matter whether you are using Windows or Mac. iFunbox is available for both. Just go to this link - download iFunbox and download the iFunbox version accordingly. For Windows iFunbox is available in .exe file and for Mac it is available in .dmg format. Download iFunbox and run it. 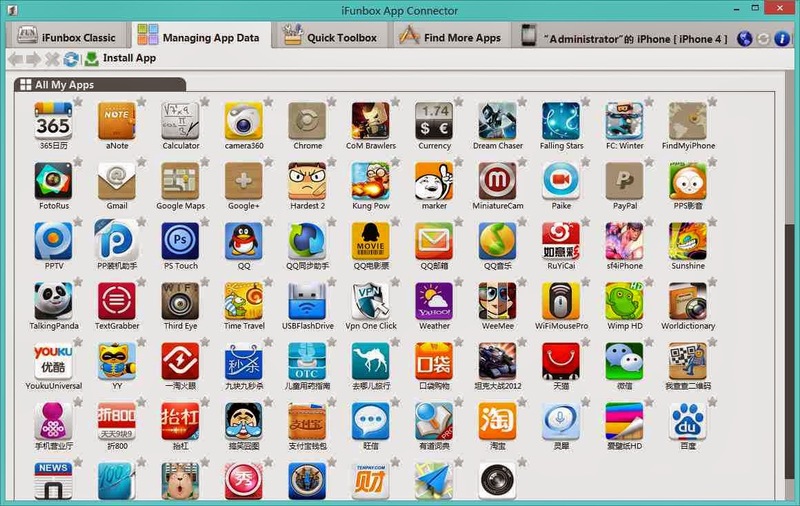 Once you have installed iFunbox on your PC connect your iOS device to your PC. Now open iFunbox app and let it detect the iOS device you connected. Once it detects the connected iOS device it will show its name in the left corner. You can now choose the cracked apps and games that you want to install on your iOS device. For this go to "iFunbox Classic" on the top left corner. Now in the left panel you will see the "User Applications" option. Click on it. And it will show you allot of apps and games on the right side. Just select any app/game and click on the "Install App" option on the top bar (you can also double click on any app/game) to install it on your iOS device. Just wait for the installation to complete. Once the installation is completed successfully it will show the message "Result of the last app installation: 1 succeeded, 0 failed." You can now disconnect your device as the chosen app or game in now installed on your iPhone/iPad. Also see - Best Cydia sources for movie box. 1. Transfer files from your iOS device to PC. 2. Navigate iPhone/iPad file systems. 3. Install free cracked apps on your iOS device for free. 4. Create backup of your files and apps on your iOS device to your PC. 5. Update your iOS freely. As iFunbox works using PC the new iOS versions will not create compatibility issues. Read - Cydia Apps to customize slide to unlock text. So this was a simple tutorial on how to install iFunbox. iFunbox is a very useful app. Use iFunbox for downloading free cracked apps, get you favorite games, music videos and create backups easily.